I had been waiting all day for this talk and at 2:50 p.m. I rushed into a room filled with six long tables. I took a seat on the front row so I wouldn’t miss anything. Waiting to greet me was an index card, a pen, and a sticker. All branded with the speakers avatar. It was an impressive first impression! I have followed Yitzchok Willroth, @coderabbi, over the past year on social media. We’ve had enough interactions that I consider him a friend, although never meeting in person. Anytime one of my friends are about to give a presentation I am nervous for them. I want more than anything for their talk to go well. As I looked up to a small black and grey stage, I seen Yitz standing behind the podium. He was performing pre-talk preperations and getting his computer hooked up and microphone wired in. He was dressed in a white button up shirt, black dress pants, and he looked a little nervous. As he wiped the sweat from his forehead, I knew the presentation was about to begin. To be honest I wasn’t exactly sure what the next 45 minutes was going to be like. The title of the talk was “Talmudic Maxims to Maximize Your Growth as a Software Developer” which are foreign words to my vocabulary. Less than two minutes into the talk, my anxiousness was quickly put aside. It was the best talk of the conference and it had everything a speaker needs. A story line, stage presence, and he kept the attendees listening intently to all the guidance. The talk was not only for software development but for life itself. I believe the big takeaway is going to be different for each person, so I will not cover the presentation content. I am hoping this talk becomes the keynote at the next conference you attend. It was that good. I feel like I got to see a rookie throw a touchdown on the first play of the first game. He gets it. I got my start in tech almost two decades ago. Back then the landscape was much different, but I feel in love, and made it my career choice. I found a friend, started selling software and doing custom development. Back then no one used the fancy term bootstrapper and I was just a partner in a small business, like thousands of others. Flash forward a lot of years and I found myself getting a full time job. Something I hadn’t done in such a long time that it was a shock. I went from setting my own hours, working a few minutes away, and wearing many hats. To having to drive an hour each day, a set schedule, limited vacation, someone else making decisions, and having to focus on just code. Are we making enough money this month? Did we put back enough for taxes? Can I afford health insurance for the family? If you notice almost everything in my list was around money. Being a bootstrapper without a large net worth is stressful. A few bad months without proper savings can hurt you in a bad way. I had a hard time with the income being unstable from month to month. This stress compounded when I had kids. Going to a full time job took away most of that. I could depend on a paycheck, had insurance coverage, and taxes would be handled like the rest of the population. That doesn’t mean it wasn’t without issues. Mostly driving into an office. I took a job in the next city over, on a good day about 30 minutes one way, but that hour a day really adds up. My kids go to bed between 7 and 8 which meant I would only get to see them for an hour or two and I didn’t like that at all. Especially in the toddler stage when they are doing all the good stuff for the first time. I was able to eliminate the drive by getting a job working remote. Which also included the side benefit of being home for lunch and to be a big part of my kids lives. Working from home is not without challenges. For me it’s mostly training the kids that during work hours they are to not be to loud and keep interruptions to a minimum. I would say that works 90% of the time but I do make an exception after school. Having them hold in their excitement until after work is impossible. The other thing I’ve heard about working from home is isolation. This hasn’t affected me and I assume it’s because of my personality. I prefer not to talk and chatting with friends via online messaging is just as well with me. You could say this is my introversion showing it’s true colors. All in all I’m happy with my experiences on both sides. One benefit is now as an employee I have a pretty good understanding of the business side, and how when you work for a bootstrapper you are an integral part of the company. I made the switch to PhpStorm back in January and every week I learn new tips and tricks to help me use the IDE. One issue I have is that I constantly forget keyboard shortcuts even though I only use a few. So I want to show a quick tip to make these easier to remember. One workaround for not having to learn them is to use the “search anywhere” feature. You can bring it up with “shift shift” and search any part of your code, interface actions, and tool windows. It’s powerful! This feature is really great but it also has a downside. I typically think of actions and windows in a different context than their actual name. 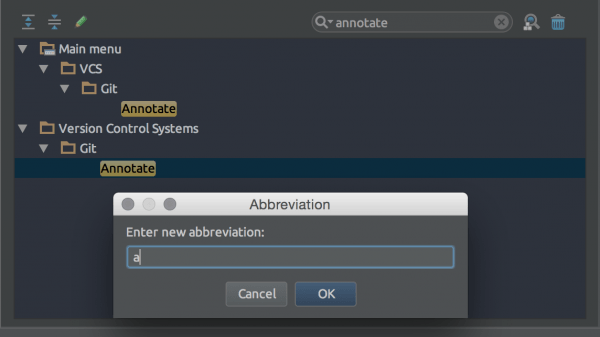 PhpStorm planned for users like me and it includes a nice way of assigning abbreviations to the keymap. Let me show how great this is. Go to settings -> apperance & behavior -> keymap. Then you can search for a command and right click to assign an abbreviation. If you have trouble remembering keyboard shortcuts or want to speed up common tasks give this a try. About a month ago my two year Verizon wireless contract ended and they had a special trade-in offer. Trade in any iPhone 4 or higher and you could get up to a $200 gift card. I thought this seemed like a decent offer and up until this point I have been satisfied with Verizon. I filled out the information on 4 iPhones, all in great condition by the way. Removed activation lock and did a full factory reset on each, then sent them off. Tonight I was sent an email with the value of the first phone. They gave me not $200, not $100, not even $50. A $36 credit! I am upset and just thinking about the run around I’m going to have to go through makes my blood boil. Apparently, I’m not the only one either. What also surprises me is that I follow a lot of Apple bloggers and I haven’t heard mention of this. Now that CodeIgniter development has been taking over by BCIT a lot of people are wondering what will happen with the framework. I’m still not really sure what the future holds but I’m happy to see them put together an interim council. A lot of names I remember from back in my CodeIgniter days and also some friends. Above all I’m happy that Andrey, David, and Ben are on this. All stand up guys that have done a lot for the framework over the years.